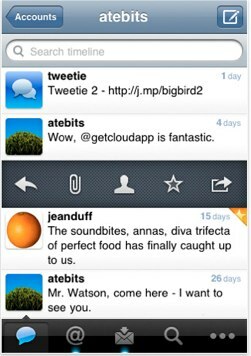 Twitter has just announced that it acquired Tweetie, the very popular and highly polished Twitter application for the iPhone . The application will now be called “Twitter for iPhone” and will drop from $2.99 to free, with developer Loren Brichter (who makes up the one-man startup Atebits) joining the Twitter mobile team. Twitter also plans to launch Twitter for the iPad, which Brichter will be involved with. It’s a move that manages to be both jarring and unsurprising at the same time. Unsurprising, because Twitter investor Fred Wilson recently wrote that Twitter developers needed to stop “filling holes” in Twitter’s product and instead build entirely separate businesses. And just this morning, Twitter launched an official Twitter for BlackBerry application, so another mobile application shouldn’t come as much of a shock. And yet, the iPhone is a platform where Twitter has a very strong third party presence, and Twitter has no doubt been benefiting from the contributions of these developers. Tweetie is extremely polished and is arguably the best, but there are plenty of other quality applications that are getting hung out to dry. Still, a move like this seemed inevitable. This all comes less than a week before Twitter’s developer conference, Chirp, where I suspect the company will try to steer developers down a path that they won’t be paving over any time soon. Of note: Twitter’s post does not mention anything about the Tweetie desktop application, which is available exclusively for the Mac. Don’t be surprised if this becomes ‘Twitter For Mac’ eventually.